Andrea V is a freelance agent. "V" is, of course, not his real last name or even last initial. His true identify remains a mystery because, as he explains in the opening words of his first recorded adventure: "The initials under which I write these confessions are not those of my real name, which I could not disclose without exposing myself to the revenge of formidable enemies." In describing his adventures he cautions "If I should be found to err on the side of frankness, I can only plead in excuse that I have never yet betrayed the confidence placed in me by the various Government and illustrious families which have employed me from time to time." He further adds, "The late Prince Bismarck once honoured me by saying: 'To tell secrets to Monsieur V is like putting them into a strong box, with the certainty that they will not come out again until one wants them to.'" Having said that, he then proceeds to tell all sorts of confidences. V explains his past by telling the reader "By birth I am a citizen of the United States of America, being the son of a Polish father, exiled on account of his political opinions, and a French mother. From my childhood I showed an extraordinary aptitude for languages, so that there is now scarcely a civilised country outside Portugal and Scandinavia in which I am not able to converse with the natives in their own tongue. At the same time, I was possessed, ever since I can remember, with a passion for intrigue and mystery." We learn also that at age 16, working at an insurance company in an office, V decided he wanted more and "ran away" to try for a job with the Pinkerton Police. "Although my youth was against me, my phenomenal comand of languages turned the scale in my favor and I was given a trial. Very soon I had opportunities of distinguishing myself in more than one mission to Europe, ont he track of absconding criminals; and in this way I earned the favourable notice of the heads of the detective police in London, Paris, Berlin, and other capitals". It was after some time that he decided to leave the Pinkertons and set up his own company in Paris where he has "been employed at one time or another by nearly every Government in the world, and my clients have included nearly every crowned head, from the late Queen Victoria to the Dowager Empress of China. I have been sent for on the same day by the Ambassadors of two hostile Powers, each of which desired to employ me against the other." This wide range of clients is attested to by the tales he relates, showing an assortment of people from far different countries and occupations needing his services. Some are practically fawning when entreating him to work for them while others are downright obnoxious and dismissive of his ethics even as they seek to lure him to their cause. Through it all, V remains (usually) unprovoked. He tells one particularly abrasive suitor, "each of us has his own part to play. The soldier fights with the enemy in the open field; the man of my profession has to encounter the foes who burrow underground." Many of the people from whom V will learn the intelligence he was hired to gain are people high up in government but not all. Having reaches in all levels of authority was something V was especially proud of for he could talk with secretaries and Secretaries alike and if one didn't know the facts, the other might. Quite often this meant greasing a palm and V was known to remark "the higher one goes, the more expensive it becomes". V is always careful that it is not he who pays the bill. Most times V is approached by a would-be client and offered an assignment which he might ponder for a bit and then take the job. Other times, he finds himself intrigued by something and he would want an answer but was too much a businessman to work for nothing so he would have to spend time finding a party willing to pay him to do the work he was already set on doing. One amusing case of this was when he used an offer of a job to "disentangle a miserable intrigue of the harem [of the Sultan of the Ottoman Empire]" and he used that unpleasant work "more suited to a private detective than to a man in my unique position" to gain an audience with the Sultan to convince him to hire him for the job V already wanted to do. While V might display more than once his unspoken set of rules concerning who he might take as a client, he is usually very open to all takers. In one case he put it in a straight-forward way with "Provided I am sufficiently well paid for my time and trouble, it makes no difference to me where I go, or whether there is anything for me to do when I get there. It must be always understood that I am at liberty to refuse this business, if I choose, without assigning any reason, and that my refusal will make no difference to my charge for the journey itself." V has his own set of rules by which he operates and he follows them strictly. He is never false with his clients; though he reserves the right to hold back things as he chooses, he will never openly lie to them. Those who have not employed him, on the other hand, should expect to be deceived at every turn for one thing that is very impressive about V is his ability to come up with a total falsehood at the blink of an eye and to pull the deception off like a stage actor. Observing him at work in this regard can bring a smile to the reader's lips. Violence is not a normal part of V's m.o. He is a man of action but rarely does that result in harm to anyone but he most definitely is not adverse to it when needed. At one point he knocks a man out to keep him from sounding an alarm. In another, he pointedly runs over a man who tried to stop his car, all with a tad remorse but no hesitation. Europe at the turn of the 20th Century had not yet seen introduction of powered flight. Telephones were gaining in popularity but had hardly reached the masses yet. Telegraph ("cable") was the means of long distance communication and V makes tremendous use of it. However, being a spy in those days was largely a matter of HUMINT (human intelligence) and that meant that V needed to be where the facts were. For that reason, he was an extremely frequent customer on the trains all over Europe and knew the schedules as well as the conductors well. Since the adventures of V are told from his perspective, there is not much in the way of description for him but in the illustrations that accompany the tales, we see that V is in his mid-to-late 40s with a receding hairline giving him a pronounced widow's peak. He sports what appears to be a petite handlebar mustache. His attire, unless he is undercover, is tailored vested suits, often checkered or pinstriped, with a bow-tie. His demeanor, even in the presence of kings and queens, is polite nonchalance showing that while he is respectful to those in authority, he is not daunted by them. Andrea V is a man who loves imparting his opinions and some of those, as well as the occasional comments by others, make for interesting reading. Below are some which caught my eye. "Curiosity is the besetting weakness of a secret service officer." "Of all men the gambler is the easiest to corrupt, because to him alone money is everything, and because there comes a time to every gambler when money is not to be had." "An anarchist is little more than a Socialist who has gone out of his mind." "The elaborate machinery of secret meetings, oaths, ballots, and so on has no existence except in the imagination of popular novelists"
"It is the curse of Anarchism that every one wants to have his own opinion." "There is nothing a fanatic resents so much as reason, except ridicule"
"It is not an easy thing to guard a monarch against his will"
"When Russia openly declares herself a tyrant, it is difficult to believe she is dissembling." "Russia has discovered that her conquests advance better under the cloak of peace"
"I have generally found the boldest game to be the most successful." Regarding secret societies, "China is the one land in which such societies are truly formidable." "The most powerful and reckless of ... Chinese societies assumed the most innocent and poetical names, as, for example, the dreaded brotherhood of the Waterlily, which deluged Southern China in blood." 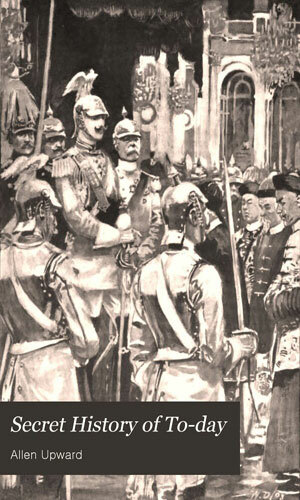 Of Kaiser Wilhelm II, he said the man was "a ruler not inclined to take too low an estimate of his own consequence." Said by a high Russian official, "No one will credit the British Government with intelligence enough to acquire knowledge of its enemies' intentions." "It [is] better to be suspected of subtlety than nescience." "I held my tongue. It is the art by which I have learned most of my secrets." "The Russians do not dislike Englishmen, as individuals, in the way they dislike Germans." "The ways of women are proverbially difficult to calculate." "[V has] the heroism of soul to save the man you hate at the prayer of the woman you love." V: "The Secret Service of Great Britain is the most scrupulously conducted in the world." Lord __: "That means, I suppose, that it is the most inefficient?" V: "It is worst paid." Lord __: "We have acted in the belief that the British Empire was too strong to care about what its enemies were planning." "I was amused to find that several of the secret agents in the service of the British Foreign Office were receiving much larger salaries from the Russian Government than from the one they were supposed to act for." "In dealing with Englishmen ... a Bank of England note inspires more confidence than a testimonial from an Archbishop." 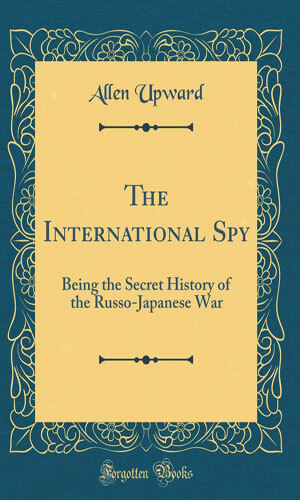 Subtitled: Being the Secret History of the Russo-Japanese War. Andrea V is summoned by the Marquis of Bedale in London on behalf of the British Government. War between Russia and Japan was just underway with small skirmishes acting as a prelude to full-force hostilities. England had promised to come to the aid of Japan in the event of a second power joining with Russia and that was expected to happen. V is hired to find some way to keep that from happening. Story 1 of 12 contained in the collection Secret History of To-Day - With tensions between England and Germany very high, word of a telegram from the Kaiser offering to help the Boers in South Africa has war about to start. The Kaiser has hired V to find out who sent the telegram for he swears it did not come from him. Story 2 of 12 contained in the collection Secret History of To-Day - Back before the Spanish-American war started, the negotiations held in Paris between Cuban rebels and the Spanish government were underway when V learns of a plot to force America into a war with Spain and he is hired by a representative of the American Sugar Trust to learn who was behind it. Story 3 of 12 contained in the collection Secret History of To-Day - Suspicions are flying all around just before the turn of the 20th century with talk of the French officer, Alfred Dreyfus, and whether he was a traitor revealing state secrets to the Germans. No less a personage than the Kaiser hires V to find out who was behind the false charges. Story 4 of 12 contained in the collection Secret History of To-Day - In 1899, Tsar Nicholas II issued a rescript calling upon all nations to disband their armies and mothball their fleets. It caused an uproar in Europe and chief among the questions that arose was who was really behind the move. V is curious himself and goes off in search of a client to pay him to learn the truth. He finds on in the Ottoman Empire. Story 5 of 12 contained in the collection Secret History of To-Day - Hearing that there were people interested in the killing of King Humbert of Italy, an unspecified European sovereign hires V to learn more about the Anarchists who seem behind the threat. Interestingly, to learn who wants an Italian monarch dead, V travels from Paris to London to New York. And then manages to find the truth lies in Ethiopia. Story 6 of 12 contained in the collection Secret History of To-Day - The King of Sweden is certain that behind the latest round of Norwegian cries for independence is the Tsar of Russia, ready to take up the sword on Norway's behalf in order to seize much of Sweden. V has been hired by the Swedish monarch to find the real state of affairs. Story 7 of 12 contained in the collection Secret History of To-Day - V is hired to travel to China to meet with the Dowager Empress. Her task for him was a daring one. During the Boxer Rebellion, the German ambassador had been killed. Germany sent a military detachment to get revenge. One demand was that a member of the royal family travel to Berlin to personally apologize. The Empress was sending an impostor, a barber who resembled one of the Princes and V was employed to go along and make sure the ruse worked. Story 8 of 12 contained in the collection Secret History of To-Day - V is hired by the Russian State Minister Witte to travel to Vienna to convince Emperor Franz Joseph of Austria to hire V to find out what the intentions of Russia are concerning Austria all to head off actions by the Russian War Minister who is plotting to attack Austria-Hungary at the earliest opportunity. According to Witte, this is at the request of the Tsar who lacks the gumption to stop the hawkish nobles in his own empire. Story 9 of 12 contained in the collection Secret History of To-Day - In relating the truth behind the death of the Countess Drago, V tells how she told him in confidence that the King of Servia insisted she marry him even though she is several years older than he, and held her prisoner until she does. A would-be rival for the throne, Prince Peter, wanted the marriage to happen as well. Knowing that the Prince's motives are less than noble and caring for the Lady, V is determined to learn all he can. Note: this had to have been written immediately after the actual assassination which took place the year before. This tale conveys of the Countess a totally different image than history has laden her with. Story 10 of 12 contained in the collection Secret History of To-Day - Andrea V is employed by the new king of England, Edward VII, to learn which of the nations of Europe were really aligned against his nation and which be considered an ally. In disguise, V heads to Berlin to undertake a scheme to intentionally get caught stealing secret documents from the Kaiser, all to purposely mislead him and. It is a very complicated and daring plot but one that is handled masterfully as one might expect from V.
Story 11 of 12 contained in the collection Secret History of To-Day - Therese Humbert was considered one of the century's great con men. She and members of her family scammed dozens of rich people by claiming to have a fortune in a safe, having inherited it from a rich American whose life she had saved one. When she was arrested on fraud charges in 1902 after many years of swindling, the safe was empty. Andrea V tells how he learned what became of the missing millions, if they were ever there in the first place. Story 12 of 12 contained in the collection Secret History of To-Day - The death of Pope Leo XIII in 1902 presented a challenge for the new king of Italy. To resolve that problem, he contacted Andrea V with a job offer. He hires V, who had in the past worked a mission or two for the Vatican, to be his secret agent in the Conclave to elect the new Pope, and in so doing help make sure the Cardinal of the King's choosing is elected. When I first looked into this series, I read two very old and very unflattering comments about the author, Allen Upward. I am, like many people, susceptible to influence and as a result I was predisposed to not like it. For that reason the ebooks sat lonely, their bytes untouched, for quite a while before I forced myself to power them up. I was surprised at what I found. The author, despite the derogatory comments of his contemporaries, was pretty good and the short stories were very entertaining. The observances of Andrea V about the world around him were spot on, studied over a century later. The author did an amazing job of taking current headlines and making plausible stories about them, injecting a fictional character into the mix and coming up with the "true, what really happened" explanations. Internet search engines were used over and over by me as I read each adventure. Knowing when the tales were published and so when they were likely written, and then seeing when the events mentioned actually took place, I found myself highly impressed at how he did not leave much time between obviously reading about something in the newspaper and coming up with his own take of things. "Ripped from the headlines" indeed.